I was lucky enough to read an advanced copy of this charming novel by Helen Simonson. Set in 1914, the summer before the outbreak of the Great War, we meet the inhabitants of Rye, a small town in Sussex England who are more focused on the perfect summer weather and garden parties than the rumored war on the continent. It is to this idyllic country town that Beatrice Nash arrives just as life for everyone is about to change. Commissioned to a position as the local school's new Latin teacher, Beatrice is met with mild hostility and skepticism by the local school governors. A free spirited, intelligent young woman, Beatrice is determined to live free of the constraints of marriage, and her independence, age and appearance is not exactly what the town had expected when they hired her. In a time of rampant gossip, vapid women's societies and general disregard of women's independence, The Summer Before the War, tells the tale of a small pastoral town, one woman and how the effects of war can change everything. Simonson's writing is charming and her characters agreeable in this beautifully wrought story about love and life during wartime. Fans of the Edwardian Era should be pleased with this novel (looking at you Downton lovers) and just as I found myself enchanted with the characters and engrossed in their day to day lives I believe that others will as well. Simonson crafts not just a story, but an experience for the reader as well as a vehicle to address social issues of the time (women's rights, class segregation and the lack of power or opportunity for women) which I greatly appreciated. 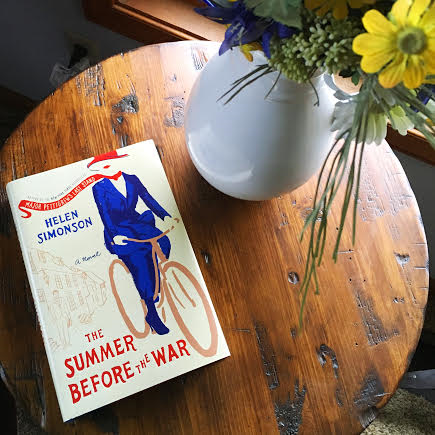 If you're looking for a charming, Austen-esque novel this spring, The Summer Before the War is it. It was one of my favorites so far this year, and definitely has a place on myself for future re-reading.